A while back, I won a gift card in an Instagram contest from Middleton Jewelers (www.middletonjewelers.com), a business in Middleton, Wisconsin. Since I had an Art Deco ring that needed some work, I contacted them and asked if they would be willing to take on the project I had in mind, and they enthusiastically said yes! With that, I packed the ring up and sent it to Wisconsin from Washington state. My Art Deco ring had a diamond that had no scintillation whatsoever and it had an overall foggy look. I had previously taken it to several local jewelers who told me they thought it had been heat damaged during routine maintenance. 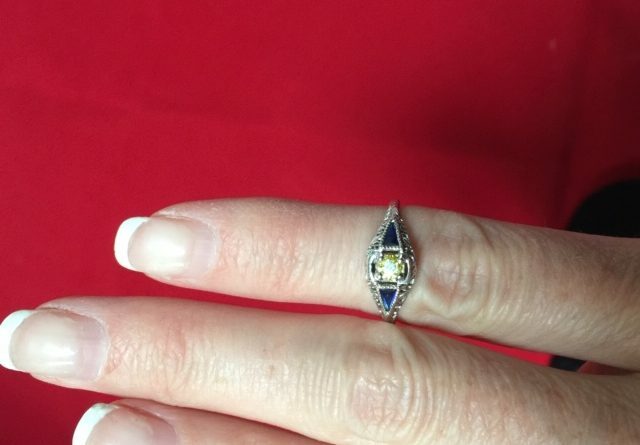 One jeweler pointed out the kite-shaped openings in the settings and said, “some day you should have the sapphires replaced.” At the time I did not know much about Art Deco jewelry and did not realize that sapphires (and rubies and emeralds) had been common accent stones in engagement rings. The project was a bit complicated, because it involved getting custom-cut sapphires. Getting stones to match each other color-wise can be a challenge, but the sapphires they put in the setting match perfectly and are of very high quality. I decided that I would like a yellow diamond in the setting, and Manny Soin, one of the owners of Middleton Jewelers, chose a great VS1 Enhanced Yellow stone that has great color. I have never worked with a jeweler that was not nearby, but it turns out this was not a problem at all, because Manny and other employees at the store kept me informed of where we were in the process by both phone and messaging. I just got my ring back, and I am absolutely thrilled with how it turned out! They also sent me a very detailed appraisal, which is a must when you have custom work done! 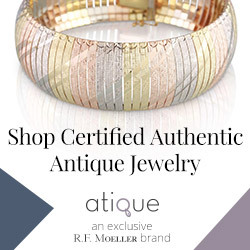 I highly recommend Middleton Jewelers – their quality and service cannot be beat!